In my last post, I decided to venture in to the untamed islands on the frontier of the Metaverse: The Open Sim Grids. Today I introduce 4 good grids to start out on, and I will introduce others in the weeks ahead. A few basics about Open Sim. Open Sim is to Second Life, what Apache is to IIS. Both are internet server software that work with a common client. To the casual visitor they will seem to be the same, but there are underlying differences that will show up when you are building. Open Sim for example does not support vehicles, but does allows prims bigger than 10 meters per side. If you are used to Second Life, you will find Open Sim grids to be very similar, and you can even use your Second Life program to connect to these Open Sim programs by adding ‘-loginuri’ and the grid web address on the client shortcut target. The Second Life client was released as open source under the GPL, allowing programmers to play with the code. The Second Life server was not released as open source, though it is for sale by Linden Labs. Open Sim is a freeware open source program that works in tandem with the Second Life client. It was built from scratch and released under BSD, and shares no copyrighted code with the Second Life Server, meaning Linden Labs has no control over Open Sims. So far Linden Labs has fully supported the Open Sim grids, but even if they stopped supporting them, Open Sims can still continue to operate legally. The upshot is, if Second Life were to suddenly close down like There or Vivaty did in the last month, the Open Sim grids would still be around. Its a safe bet that as long as there is an internet there will be Open Sim grids available to play in (in the same way that text based MUDs have been around for over 30 years). Despite the number of grids being more then 300, the total combined regions, players, and traffic on these grids is considerably lower than Second Life. Second Life is more than twice as big as all the Open Sim regions combined. The people that run these grids do not always have the resources to make sure the grids are stable and always online, so sometimes logging in is a problem. Inventory can suddenly disappear as well occasionally. Luckily its all free. Before you begin, you are probably going to want to get a dedicated client. The Hippo Viewer is designed primarily for Open Sim use, and allows you to log in automatically to many different grids. Decide on a name as well and use it on each grid. I am Ariane Barnes on all of these grids. A common name makes switching grids easier. You may notice that I am wearing nearly the same thing in each picture. These are the nicest hair and clothes I have available in my Second Inventory program to upload. When you first join these Open Sims, you will look like “Ruth”, as they call the default avatar. All of these grids have freebie avatars available if you don’t have your own hair, skin, or clothing textures to upload. Second Inventory allows you to move stuff that is free and full perm or stuff that you made yourself to other grids, but the program itself is not free. There are free and legal ways to move inventory between Open Sim grids by “hypergridding” but that is a topic for later. The four Open Sim grids I have chosen to post about first are all free, all allow free uploads (textures, animations etc. ), have free sandboxes that allow Second Inventory uploads, and all have English as a primary language. These four also are representative of many different kinds of grids out there. Inworldz is the smallest of the grids I am visiting. I picked this one first as it is the most SL like. They host some mainland regions as well as offer private grids at considerably lower than SL costs. They also have their own in world currency the Iz exchangeable at $1 = 500 Iz. Inworldz reminds me of SL as it once was: small, friendly, and very experimental. Its a place to build and play, and hang out in the welcome center and chat. The picture above was taken at the Inworldz welcome center. OSGrid is by far the largest of the Open Sim grids, it is sort of the closest thing there is to an “official” Open Sim grid, though there really isn’t such a thing. OSGrid.org is a non-profit organization and maintains a small core of regions and the grids main asset servers via donations. They do not sell or rent space. Instead, they provide a service where you can attach your own private region up to the grid for free if you have your own web server. I have seen hosting services offer your own private OS region hooked up to the OSGrid for as cheap as $15 a month. Dedicated core regions with 15,000 prims can be obtained for $30 a month with no initial setup costs. A real bargain! 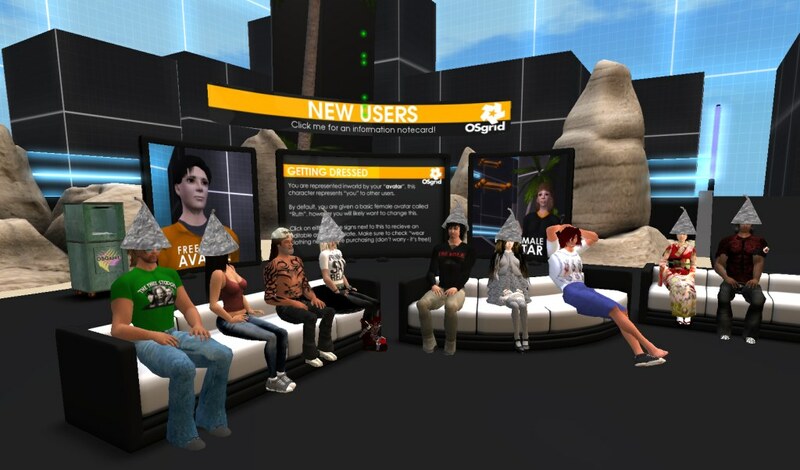 The downside is that the OSGrid is made up of hundreds of different providers, including many regions hosted on home computers connected with home broadband. No telling what regions are up or down at any given time, and no central authority to go to for troubleshooting, or reporting bad behavior of other players. It is very close to a 3D internet in that regards. No central authority also means no central economy. Sales of in world items are done through PayPal usually. Reaction Grid is a PG rated business friendly grid designed to be a place to host company meetings and conferences. It is also used by schools and colleges for online courses in a 3D environment, which means you can expect to run into student created builds as you explore. Many companies and colleges that used to be in SL have moved here for budget reasons. Like OSGrid, Reaction Grid allows independently hosted grids (meaning there is no in world economy), but unlike OSGrid, Reaction Grid maintains some control over the grid so they can troubleshoot problems. Reaction Grid has a good reputation as a result and an impressive list of clients. New World Grid is an artistic community sponsored by multiple non profit charities based in England, France, and Canada. The primary one being Virtus France. The grid is completely bilingual, everything labeled in English and French. There is no in world economy, but because it is primarily an artist community, there are lots of freebies to be found. Some lands are rentable, but you can also petition for a free land grant if you have something worthwhile to build and share with the community. The latest addition was a region dedicated to “Life After There” for former therians. If you go there, an incomplete Saja like platform hovers in the sky. I include this grid as a good example of the majority of the grids out there. Most of the grids I researched have a primary language other than English, providing a 3D multiplayer environment for people that speak something other than English. There are at least 4 grids for German speakers, and they are working out a common currency between them. I have also seen Spanish, Italian, Korean, Japanese, and Portuguese grids, probably others. There are many more grids out there to explore. The grid list maintained at OpenSimulator.org is unfortunately out of date, with a lot of closed grids. I have a list of 30 grids known to work on my 3D Virtual Worlds page (under the RealXtend / Open Sim Project section). This page lists 40 grids, with a note that there are over 300. The next few posts will also be about Open Sim. Next, I will revisit setting up your own private grid (it keeps getting easier) with links to free content, then take a tour of a couple of really impressive private grids, then walk through the hypergrid process which shows promise to join all the grids together in a single 3D world wide web. Great reviews — and gorgeous snapshots! These are just the 40 largest public grids. For a grid surfer, though, you might be interested in the hypergrid, instead. No need to register new accounts, create and dress new avatars, or upload your clothing all over again. Just click on an address and teleport — your existing avatar comes with you. It’s not as easy as surfing the web — but it’s getting there pretty quickly. And it’s WAY easier than creating new avatars all the time. Plus, you can go shopping on multiple grids and bring stuff back to your home region. See my latest post (4/24/10) for a response. I tried the hypergrid thing. Still buggy but I’m hopeful it will improve. Reblogged this on Welcome to Mia Jonita, SLE, and Depts, twitter.com/miajonitaresort. Cyan it is not a Game per say, more like real life, but you can do so much more..Sort of like The Sims only on Steroids. there is no win or loose.. just learning, making friends, knowing the rules of logic and manners. check out youtube and look up Second life.. the information there, should help you out more than anything else I could suggest.